Computer monitors are kind of device that just works. That is until they don’t. Despite plenty of advanced hardware info software, very few apps provide more than basic information about displays. 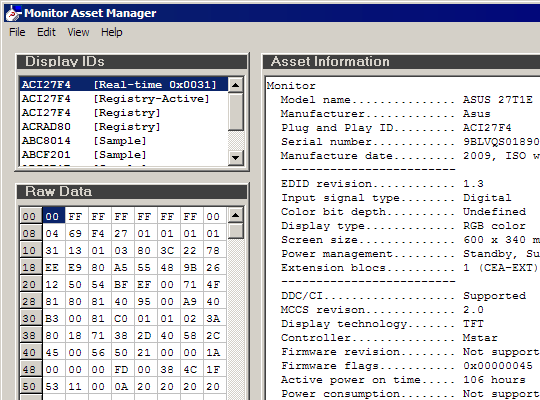 MonInfo (from developers of popular PowerStrip shareware) is specialized app that provides extensive information about monitor hardware. App enumerates properties (which is bunch of hex code in EDID profile) off all monitors in system and provides human-readable interpretation. Information is gathered both directly from hardware and from registry settings. Latter includes monitors that are not currently connected. More than thorough and provides as much information as possible. App can both read and write data in number of formats. It can also generate INF files, which can be used as custom monitor driver. Aside from being free for personal non-commercial use only I don’t see a single missing or incomplete feature here. It can be little overwhelming with details, but never short on it. Great specialized tool to troubleshoot and fix display issues. Rare tool for admittedly rare task, but lifesaver when you need it.